Have you ever needed to send material encoder signals to more than one device? Have you ever needed to switch between two different encoders? 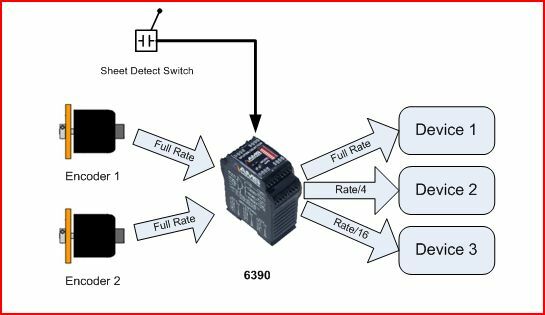 The 6390 Encoder Splitter / Switch Module is a practical solution to these common roll former control problems. Configuration switches are used to set the operating mode and other options. When adding an ink-jet printer or other peripheral device to a roll forming machine, a common problem is where to get the extra encoder signals. Because of termination resistance, you cannot simply daisy-chain or wire in parallel encoder signals without risking erratic results or possible damage to the encoder or control devices. Adding more encoders and measuring wheels is awkward an often impractical. The 6390 takes the quadrature signals from a single encoder and accurately regenerates the signals for up to four devices. If not all of the devices need or can handle the same pulse rate, the 6390 also includes a divider feature that divides the pulse frequency by 2, 3, 4, 6, 8, 12, 16, 24, 32, 64 or 128 per device. When working with devices that do not accept differential signals, the 6390 also has an extra transistor output channel that can switch up to 50V signals. In order to reduce the scrap that is created when loading or unloading a coil, it can be very helpful to have two material encoders (one near the beginning of the machine and one near the end). In this scenario, the 6390 can be used as a switch to select between the two encoder signals. 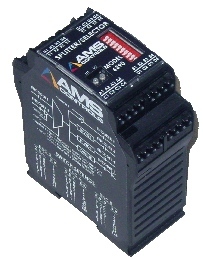 A 24VDC signal is used to select which encoder input should be used.